Natural Mic is a music series in the Hudson Valley, hosted by the folk/americana band Living Roots. The series celebrates un-amplified, acoustic music in local venues that have “naturally” good acoustics. 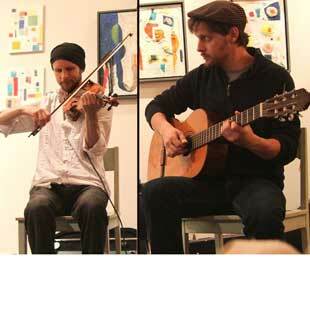 On Friday, October 13 Natural Mic brings us to the beautiful acoustic of the Spencertown Academy with local violin/guitar duo, Quiet In The Head. This will be a cafe setting with light refreshments available. Quiet In The Head is the ongoing musical project of guitarist Séamus Maynard, violinist Jonathan Talbott, and many guest musicians. Their original acoustical music has evolved over many years of playing together and is always an exploration of texture and melody. There are echoes of familiar influences from Middle Eastern and Eastern European music, but ultimately searches far and wide for new sounds. Improvisation plays a large part in Quiet In The Head’s compositions but the core of the music is through-composed. Significant instrumental technique never overshadows the inherent musicality, beauty, and sometimes strangeness of the soundscapes created by the group.